VSI5X crusher (the latest vertical shaft impact crusher improved from VSI crusher) is widely used for powder process of mineral products, especially for manufactured sand or artificial sand production. 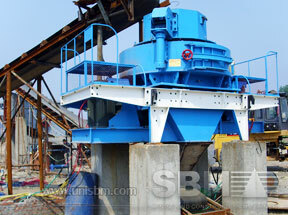 SBM VSI5X crusher is an necessary crushing equipment used in manufactured sand production line, sand & gravel production plant etc.. The Raw materials like grit, rubble can be converted to high quality artificial sand, which is for ready mix concrete industries. The VSI5X crusher also can be used in processing hard materials such as metal and non¬metal ore, fireproof material, bauxite, diamond dust, glass raw materials, architectural materials and so on. The proved VSI5X crusher is popular in many countries because the features as follows: low power consumption, environmently friendly, compact footprint, ground cubic shape of final products, easy operation etc..
Transport and Commercial Ltd (TCL) is one of the oldest and most important quarries in the region. It has build a plant dedicated to the production of manufactured sand, not only to satisfy the increasing demand, but also to provide a superior quality products, particularly in particle cubicity that was still not satisfied simply by washing the fine aggregate. 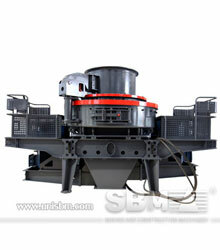 VSI5X crusher has helped it to achieve the goal. The VSI5X crusher works in the final reduction phrase, generating particles with ideal gradation and particle shape for concrete production. "The VSI5X crusher designed for sand making machine is the best friends for manufactured sand producer like TCL"
The Trekkopje mine is a uranium mine located in western Namibia in southern. Mining will be carried out using conventional methods and ore feeding to the treatment plant. Ore will be crushed in a stationary primary crusher located near the pit. VSI5X crusher plays role as fineness crushing in the Uranium ore treatment plant. The VSI5X crusher can reduce the crushed uranium ore into fine powder down to 2mm, so that the processing plant can go on well. Based on a stripping ratio of 1:15, the mine will process 100,000t of crushed ore per day. "We order the VSI5X crusher from SBM Machinery, these crushers works well with the cone crusher, and handle the ore minerals easily"